A couple weeks ago, Contributor Extraordinaire and I met our friend (and Resistance Pro wrestler) Eric St. Vaughn at The Squared Circle, a pizza and burger place owned and operated by Lisa Marie Varon. We also ran into Matt Knicks and Chris Castro (two other wrestlers also known as the Two Star Heroes). Immediately upon entering The Squared Circle, LMV greeted us with big hugs and a big smile. While enjoying our pizza and appetizers, she came over several times and joined us for some casual chat. I wrote about the experience for the Patch at On the Beat with Eric St. Vaughn and Lisa Marie Varon at The Squared Circle. Today, I want to write about how cool Lisa Marie Varon is. We had met her several times prior to this evening at various conventions and she has always been friendly, sweet and fun. She has given us interviews, put us in wrestling holds, showed us her infamous ankle tattoo and other fun stuff. More importantly, she gives us her warmth, friendship and spirit. Wrestling is a hard business. It is highly competitive in and out of the ring. While others have made headlines for the wrong reasons, I have never seen a bad thing about LMV. She has apparently lead a normal life and seems to be determined to keep it that way. The Squared Circle is a lot like her and not just because of the wrestling theme. It is fun and lively, but also comfortable and casual. It is the kind of place I would gladly take visiting friends for a great night. It is also the place I could go regularly as a neighborhood spot. I think The Squared Circle is a winner, like LMV. I really hope The Squared Circle is a success. Lisa Marie Varon deserves it and besides...I really loved their pizza!!! 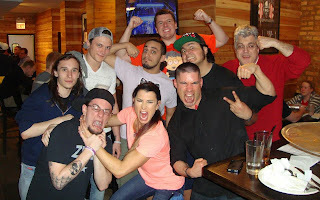 Matt Knicks, Matt Parker, Chris Castro, Eric St. Vaughn, me and a few others have fun with Lisa Marie Varon at The Squared Circle in Chicago, IL-April 2013. Eric St. Vaughn reviews The Squared Circle in Chicago, IL-April 2013.